When’s the last time one of your children came to you for a real heart-to-heart chat? Has it been over a year since you’ve held your sides with giggles while doing something silly together? Do you feel like you are constantly battling video games, cell phones and the Internet in order to get a one-sentence response—let alone a conversation—with your kids? In this fast-paced, over-scheduled world, months can go by without real conversation and that’s too much for my liking. I’ve thought about the times when I’ve really connected with my kids to recall what triggered our closeness. And since no two kids are a like, I’ve reached out to experts as well for more ideas. Here are the top tactics that may help you bridge the communication gap and get your kids talking. Experts agree kids chat more with you while busy doing a physical activity together. I learned this when I was a camp counselor one summer break from college. Campers between the ages of six and 17 stayed the entire summer at this camp in the Pocono’s that catered to Manhattanites. 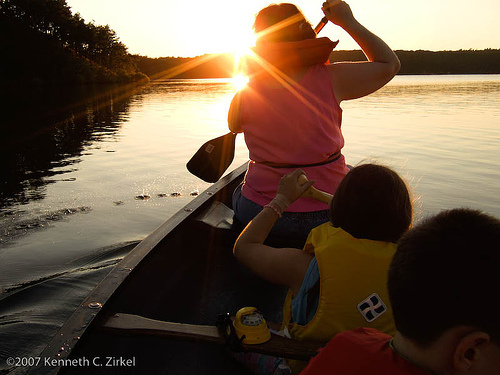 My job was to take each child out in a canoe, teach them the basic strokes, and later take small groups on trips. I was amazed at how the children, from the youngest to the oldest, would open up after 10 minutes or so of hard work in the canoe—especially the boys. The repetitive motions in the sun and fresh air, seemed to get even the shy kids babbling about friends, parents, school, pets, etc. I was overwhelmed with the sadness of some of the stories: a daughter raised by a slew of nannies; a son whose dad left when he was a baby; an eleven-year-old girl terrified her mom wouldn’t visit unless she landed the leading role of the camp play. …It goes on and on. I would listen and correct their J and C strokes. By the end of the summer, I was convinced that the best therapy in the world occurred while canoeing, hiking, running, or just walking with someone you trust. Even if you have a demanding work schedule, mini hikes on weekends or even walking into town for an ice cream, can inspire meaningful conversation or simple fun. This may seem corny for some, especially teens, but give it a go anyway. Experts say it works if you incorporate your kids’ interests. So if your children hate scrabble or charades, don’t impose that on them.“It’s all about finding out what they like to do. What are their interests? And what is their temperament?,” points out Rona Renner, R.N., a parent educator, mom of four, and founder and host of Childhood Matters Radio Show. As an example, Renner says she purchased a ping pong table when one of her sons was 13-years-old and put it in the living room.“We just needed something to do together that we both enjoyed. When he turned 13 and entered junior high, it felt like overnight we just had nothing in common,” she reflects. The times playing ping pong were “precious” as it helped them reconnect and just have some fun. I know this is a hard one for some. It may not be feasible to volunteer often at your children’s schools. But, if possible, find out all the different events and activities with parent involvement and sign up for one. Even if you’re only able to take off one day of work and spend one day being a chaperone on a school trip, you’ll get a chance to see your child’s friends and meet more parents. Dipping into your kids’ worlds at school opens up a host of things to talk about. Can’t squeeze in quality time during the day? Try it at night! That’s right. Sleep talk therapy is becoming recognized by experts as a way to reinforce your love and encouragement to your children. Believe it or not, it works! A child hears differently in a sleep state and once you introduce yourself as his/her parent, your child rises into an alpha state of sleep where he can hear you, but doesn’t wake up. Please read my article “Connect With Your Children While They Sleep” to see how it works in detail. I call these the zone-out toys. For my oldest son it’s video games—but for others it can be online chat, Facebook, texting, Nintendo, TVs and computers in bedrooms or other solitary activities that keep kids away, silent and in their own worlds. Put limits on these and offer up fun activities to do together when possible and see what happens. It’s hard to connect to a parent who has his laptop on his knees at all times. So try to leave your work behind when you’re home and hanging out with your family. Experts say carving out family time—even if just for an hour in the evening—sends the message to kids that they are important. And if your teens (especially boys) barely notice, Courtenay says to have patience. “Patience is also important. A man I work with just today talked about how grateful he was to his mother for giving him time to “warm up.” Driving home from school, he’d be silent for what seemed like an endless amount of time—which she wouldn’t interrupt—and then finally, he’d be ready to open up to her.” The morale to that story is not to nag or push. Sometimes becoming a friend (even to your children) takes being a friend. Lighten up, listen and take the time to get to know one another. Another article for inspiration: Stay Connected: Family Fun That Doesn’t Cost a Fortune. This entry was posted in Parenting and tagged Addiction, Adolescence, alcohol and addiction and teens, better communication with your kids, building a better relationship with your kids, Camp counselor, Child, Childhood Matters Radio Show, Columbia University, Columbia University’s National Center on Addiction and Substance Abuse, communication with teens, expert tips to help your kids open up, Facebook, Family, family activities, family dinner, Family fun that doesn't cost a fortune, family game night, family time, helping your kids open up, Home, how a family pet can help your child, how family dinners can help your teen, Kids, Life, limiting internet, online chat and your teen, Parent, Recreation, Rona Renner, Sleep Talk, Summer camp, Table tennis, teens, Will Courtenay. Bookmark the permalink.